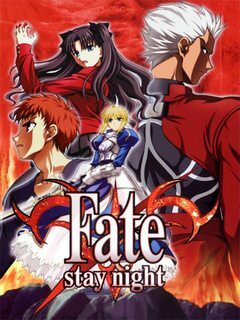 Fate/Stay Night is a 2004 visual novel by TYPE-MOON and written by Kinoko Nasu, in which modern-day mages summon heroic spirits from the past to do battle in order to win the holy grail. It has since been adapted into a manga and anime TV series, including a feature length anime film. A spinoff for Fate/kaleid liner Prisma Illya, see: fate-kaleid-liner. For more information, see the wikipedia page, ANN's Encyclopedia entry, or the TYPE-MOON wiki. What are Archer's twin swords based off of?